Definition at line 46 of file llhttpassetstorage.h. Definition at line 399 of file llhttpassetstorage.cpp. Definition at line 409 of file llhttpassetstorage.cpp. Definition at line 433 of file llhttpassetstorage.cpp. Definition at line 419 of file llhttpassetstorage.cpp. References mBaseURL, mCurlMultiHandle, mHostName, and mLocalBaseURL. Definition at line 673 of file llhttpassetstorage.cpp. References LLAssetType::AT_TEXTURE, LLAssetRequest::getType(), LLAssetRequest::mDownCallback, LLAssetRequest::mIsPriority, LLAssetStorage::mPendingDownloads, and LLAssetRequest::mUserData. Definition at line 1251 of file llhttpassetstorage.cpp. References getRunningList(), llendl, llerrs, and request(). Definition at line 1278 of file llhttpassetstorage.cpp. References LLUUID::isNull(), llendl, llwarns, LLTempAssetData::mAgentID, LLTempAssetData::mAssetID, LLTempAssetData::mHostName, and mTempAssets. Definition at line 1006 of file llhttpassetstorage.cpp. References deletePendingRequest(), end, FALSE, LLMessageSystem::getMessageTimeSeconds(), llendl, llwarns, LLAssetType::lookup(), LLAssetRequest::mIsUserWaiting, LLAssetStorage::mPendingUploads, mRunningUploads, and LLAssetStorage::RT_UPLOAD. Definition at line 732 of file llhttpassetstorage.cpp. References LLAssetStorage::_callUploadCallbacks(), addTempAssetData(), LLAssetType::AT_OBJECT, bumpTimedOutUploads(), LLAssetStorage::checkForTimeouts(), LLHTTPAssetRequest::cleanupCurlHandle(), count, LLHTTPAssetRequest::curlCompressedUploadCallback(), curlDownCallback(), curlUpCallback(), deletePendingRequest(), LLAssetStorage::downloadCompleteCallback(), findNextRequest(), LLUUID::generate(), getBaseURL(), LLVFile::getSize(), LLAssetRequest::getType(), LLAssetRequest::getUUID(), HTTP_MISSING, HTTP_NO_CONTENT, HTTP_OK, HTTP_PUT_OK, HTTP_SERVER_BAD_GATEWAY, HTTP_SERVER_TEMP_UNAVAILABLE, LL_ERR_ASSET_REQUEST_FAILED, LL_ERR_ASSET_REQUEST_NOT_IN_DATABASE, LL_ERR_NOERR, LL_EXSTAT_CURL_RESULT, llendl, llinfos, llwarns, LLAssetType::lookup(), MAX_STRING, mBaseURL, LLHTTPAssetRequest::mCurlHandle, mCurlMultiHandle, mHostName, LLAssetRequest::mIsUserWaiting, mLocalBaseURL, LLAssetStorage::mPendingDownloads, LLAssetStorage::mPendingLocalUploads, LLAssetStorage::mPendingUploads, LLAssetRequest::mRequestingAgentID, LLHTTPAssetRequest::mRequestType, mRunningDownloads, mRunningLocalUploads, mRunningUploads, LLAssetRequest::mTime, LLAssetRequest::mTimeout, LLHTTPAssetRequest::mTmpUUID, LLHTTPAssetRequest::mURLBuffer, LLHTTPAssetRequest::mVFile, LLAssetStorage::mVFS, NULL, nullOutputCallback(), LLHTTPAssetRequest::prepareCompressedUpload(), LLVFile::remove(), LLVFile::rename(), LLAssetStorage::RT_DOWNLOAD, LLAssetStorage::RT_LOCALUPLOAD, LLAssetStorage::RT_UPLOAD, S32, LLHTTPAssetRequest::setupCurlHandle(), LLUUID::toString(), TRUE, and UUID_STR_LENGTH. Definition at line 1401 of file llhttpassetstorage.cpp. References llendl, llinfos, and mTempAssets. Definition at line 1048 of file llhttpassetstorage.cpp. 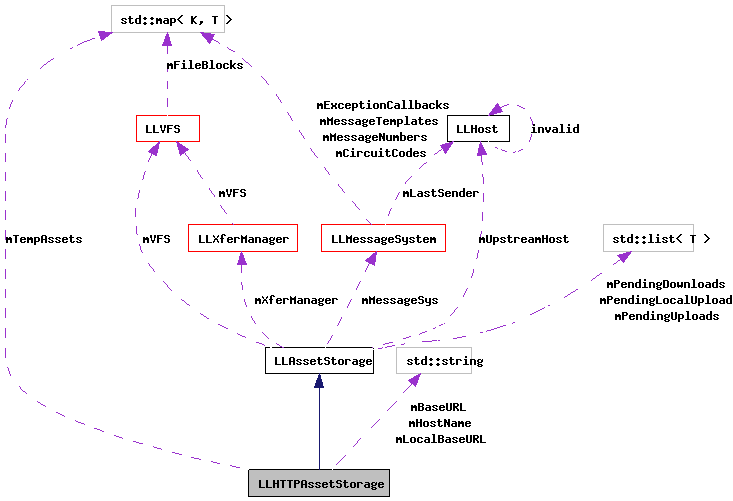 References LLVFile::APPEND, LLAssetType::AT_NONE, gAssetStorage, LLVFile::getSize(), llendl, llmax(), llmin(), llwarns, LLHTTPAssetRequest::mTmpUUID, LLHTTPAssetRequest::mVFile, LLAssetStorage::mVFS, NULL, S32, LLVFile::setMaxSize(), and LLVFile::write(). Definition at line 1205 of file llhttpassetstorage.cpp. References llendl, llwarns, LLHTTPAssetRequest::mFP, and NULL. Definition at line 1078 of file llhttpassetstorage.cpp. References gAssetStorage, LLVFile::getLastBytesRead(), LLVFile::getSize(), LLAssetRequest::getType(), LLAssetRequest::getUUID(), llendl, llmin(), llwarns, LLHTTPAssetRequest::mVFile, LLAssetStorage::mVFS, NULL, LLVFile::read(), LLVFile::READ, S32, and LLVFile::tell(). Referenced by bumpTimedOutUploads(), and checkForTimeouts(). Definition at line 1372 of file llhttpassetstorage.cpp. References count, end, LLUUID::isNull(), llendl, llinfos, mTempAssets, and S32. Definition at line 1356 of file llhttpassetstorage.cpp. References LLAssetType::AT_TEXTURE, llformat(), LOCAL_ASSET_URL_FORMAT, mBaseURL, and mTempAssets. Referenced by addRunningRequest(), and removeRunningRequest(). Definition at line 1317 of file llhttpassetstorage.cpp. Definition at line 1303 of file llhttpassetstorage.cpp. Definition at line 1113 of file llhttpassetstorage.cpp. References curlFileDownCallback(), LLFile::fopen(), GET_URL_TO_FILE_TIMEOUT, LLTimer::hasExpired(), HTTP_MISSING, HTTP_OK, LL_ERR_ASSET_REQUEST_FAILED, LL_ERR_ASSET_REQUEST_NOT_IN_DATABASE, lldebugs, llendl, llinfos, llwarns, mCurlMultiHandle, LLFile::remove(), LLAssetStorage::RT_DOWNLOAD, S32, LLTimer::setTimerExpirySec(), size, and TRUE. Definition at line 1295 of file llhttpassetstorage.cpp. Definition at line 1102 of file llhttpassetstorage.cpp. Definition at line 1264 of file llhttpassetstorage.cpp. Definition at line 1331 of file llhttpassetstorage.cpp. Definition at line 1337 of file llhttpassetstorage.cpp. References end, LLTempAssetData::mAgentID, and mTempAssets. Definition at line 488 of file llhttpassetstorage.cpp. References LLFile::fopen(), LLAssetStorage::legacyStoreDataCallback(), LL_ERR_CANNOT_OPEN_FILE, LL_EXSTAT_BLOCKED_FILE, llendl, llinfos, LLAssetType::lookup(), LLLegacyAssetRequest::mUpCallback, LLLegacyAssetRequest::mUserData, LLAssetStorage::mVFS, LLUUID::null, LLFile::remove(), S32, LLVFile::setMaxSize(), size, storeAssetData(), LLVFile::write(), and LLVFile::WRITE. Definition at line 148 of file llhttpassetstorage.h. Referenced by _init(), checkForTimeouts(), and getBaseURL(). Definition at line 152 of file llhttpassetstorage.h. Referenced by _init(), checkForTimeouts(), getURLToFile(), and ~LLHTTPAssetStorage(). Definition at line 150 of file llhttpassetstorage.h. Referenced by _init(), and checkForTimeouts(). Definition at line 149 of file llhttpassetstorage.h. Definition at line 154 of file llhttpassetstorage.h. Definition at line 156 of file llhttpassetstorage.h. Definition at line 155 of file llhttpassetstorage.h. Definition at line 158 of file llhttpassetstorage.h. Referenced by addTempAssetData(), clearTempAssetData(), dumpTempAssetData(), getBaseURL(), getTempAssetAgentID(), getTempAssetHostName(), hasTempAssetData(), removeTempAssetData(), and removeTempAssetDataByAgentID().